Today I'm going to share a really nice app. Unfortunately it's not free but it's good to have it. The app name is "Locate". In the description it's written that of you've forgot your device like at home or office and you wanna confirm that it's there then send a specified SMS to your device from any number and you'll be updated with it's current location. AnonD-53410, 04 May 2012i want to exchange my neo v with n9 . is it right to do thisOf cours it's a good choice. Even exchanging it with SGS2 would be a good decision too. Nokia's management is really blind. Look how others are following the swipe. After watching this video I really wanna kill Elop and I'm thinking my next device may be running Blackberry 10 OS. AnonD-53410, 04 May 2012i want to exchange my neo v with n9 . is it right to do thisIf you want to have to many apps then don't go for N9. But if you want to try different OS. 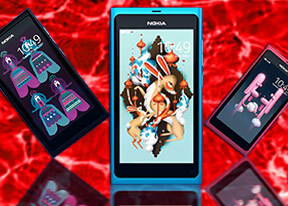 Innovative OS and innovative design then go for N9. i want to exchange my neo v with n9 . Hey Guys, when will be this phone available in India? PstD, 04 May 2012Am having problem with the storage memory of my N9. It has a memory capacity of 32GB, but it c... moreAre you kidding with us? AnonD-49722, 04 May 2012hey, actually i do not agree with you say that android is running more smoothly on n9, because... moreWhat I've said about Android running better on N9, it's just not my view. It had been proved by many developers. You can check mynokiablog.com. Games like GTA 3 running much smoother on N9 in comparison with S2 and iPhone. And S2 hang a lot on ICS. Actually the chip used in N9 is very powerful and the comparability of hardware with each other is great. PstD, 04 May 2012Am having problem with the storage memory of my N9. It has a memory capacity of 32GB, but it c... moren9 with 32GB memory capacity ... seriously ??? Am having problem with the storage memory of my N9. It has a memory capacity of 32GB, but it cannot even take a video coverage. It will always write "not enough memory". What will i do guys? Ch.Saqib, 04 May 2012MeeGo is running much better on N9 of I compare it with other phones in the case of smoothness... morehey, actually i do not agree with you say that android is running more smoothly on n9, because i myself recognized that n9 just clock at1ghz with single core, and sgs2 with dual core, but of course i feel meego is running better on n9 than any other phone. Hardware reliable as always, beautiful design, easy to use, tho the downside is the limited applications. pp, 28 Apr 2012Maybe because of the os. Meego won't have support or development, that may scare people off. I... moreYet it was scoring very well in spite of that until very recently. I dont think that explains why it suddenly dropped so heavily in the charts. Has anyone approached the website admins about this? AnonD-49370, 04 May 2012 guys i have a questin... we all know meego is beeing starved by major software and hardware ... moreMeeGo is running much better on N9 of I compare it with other phones in the case of smoothness etc. You may also know that Nitroid which is Android for N9 is running better than the S2. It's Android 4.0.4. That means it's hardware it's much superior. Pouring MeeGo to other devices, I don't think it's gonna happen. I've never seen any project like this. Also you know that MeeGo has limited apps. Most of the people don't like it because of this. I don't think they are interested in porting it to other devices. One more thing for running MeeGo just like on N9 you need a device have curved glass. Otherwise it'll be difficult to swipe from the edge of the device.